It's a good time to be dining out in the Washington area, thanks to a cadre of up-and-coming talent. Meet the Washington area's culinary rising stars, annointed recently by StarChefs.com, an online culinary magazine. 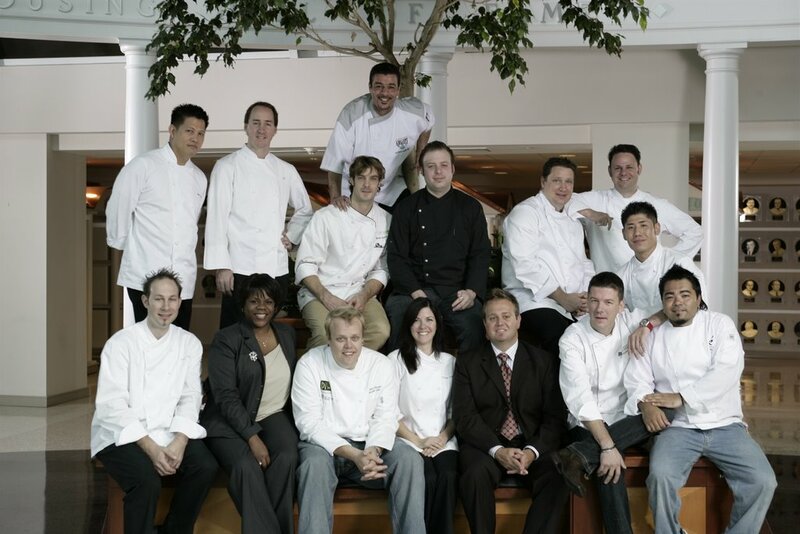 Pictured above, they are (front row, from left): Tony Conte of The Oval Room, sommelier Nadine Brown of Charlie Palmer Steak, Tony Chittum of Dish and Notti Bianche, pastry chef Heather Chittum of Dish and Notti Bianche, bar chef and sommelier Todd Thrasher of Restaurant Eve and PX, Bart Vandaele of Belga Café, Katsuya Fukushima of Café Atlantico, (back row) host chef Arnel Esposa of Palette, Eric Ziebold of CityZen, Barton Seaver of Café Saint Ex and Bar Pilar, pastry chef Hichem Lahreche of Kinkead’s (standing), pastry chef Tom Wellings of Maestro, RJ Cooper of Vidalia, Cathal Armstrong of Restaurant Eve and Noriaki Yasutake of Perry’s. You can literally meet the rising stars Dec. 13 at the StarChefs Rising Stars Revue. From 7 to 9:30 p.m., guests will have the opportunity to taste dishes from all of the honored chefs (check out the menu). Tickets for the dine-around event, held at the National Housing Center at 1201 15th St. NW, are $95 and are available here. The event will benefit a worthy cause, DC Central Kitchen. According to StarChefs.com, the "revue is a traveling series of tasting events showcasing chefs from around the country who are coming into their own as young leaders in the culinary field." The rising stars were nominated by an advisory board made up of more than 20 of the country's top chefs including Daniel Boulud, Norman Van Aken, Jean-Georges Vongerichten, Todd English, Todd Gray, Ken Oringer, Marcus Samuelsson and Bobby Flay. StarChefs.com’s editorial team made the final choices based on in-person tastings and interviews. Congrats to all those being recognized! And a damn good chef. He might be a good chef but let's be honest, it seems like he cares more about becoming a supermodel than a chef with a social message. Instead of posing for style magazines and participating in DC's bachelor pageants, he should be out educating the people who really need to be educated. This is a prime example of what is wrong with America, anyone can become famous with a PR agent. So what if Seaver has a good PR rep (doesn't everyone), that doesnt' change the fact that he is one of DC's most dedicated and passionate chefs. He works hard and cares more about his food than the media attention that comes with being a 27-year old wiz in the kitchen. I think we all shall see great things from him in the future. Just a few points: I have intentionally allowed anonymous comments on Metrocurean so as to not discourage people from sharing their thoughts, but when a comment criticizes an individual, by name, please leave your own name. To amend the old adage: If you don't have anything nice to say, own up to what you're saying. And unless you've sat down with Barton, asked him about his philosophy on food and cooking, or analyzed how he really spends his time, it's unfair to make such claims. Barton is one of the city's most active proponents of sustainable seafood and recently headed up Slow Food's Sustainable Seafood dinner and fundraiser here in D.C. The menus at Saint-Ex and Bar Pilar alone speak for his commitment to local farmers. Having lunch there just the other day, I was pleased to see a truck belonging to a local organic farm parked out front, meaning that burger I was eating came from an environmentally responsible and humane establishment. As a diner, I wish I knew more chefs in town with this much concern for what they're putting on your plate. To continue along Amanda's vein, the award received was given to him and all other honorees based not on their good looks or popularity in the press, but on their skill and, particularly in Barton's case, dedication to bettering the community of which they are a part. Barton has the strong culinary, social and environmental philosophy, the tireless dedication, the leadership ability and the culinary talent that are the makings of a great chef. I second the previous two comments. Bart gets a lot of press because he's cool, not the other way around. And yes, he is attractive, but so are many others on the DC food scene. I think that it's the passion these people have that encourages our adoration. Further, having worked with him on several occasions, I believe he is an extremely hard worker who has both his feet on the ground and a pretty humble head on his shoulders. This guy is so full of himself - using his business to promote himself. He's hardly the first chef to use locally grown produce and meats. Maybe it's time he cooked himself a batch of humble pie and ate it.